Making plans for July 4th? 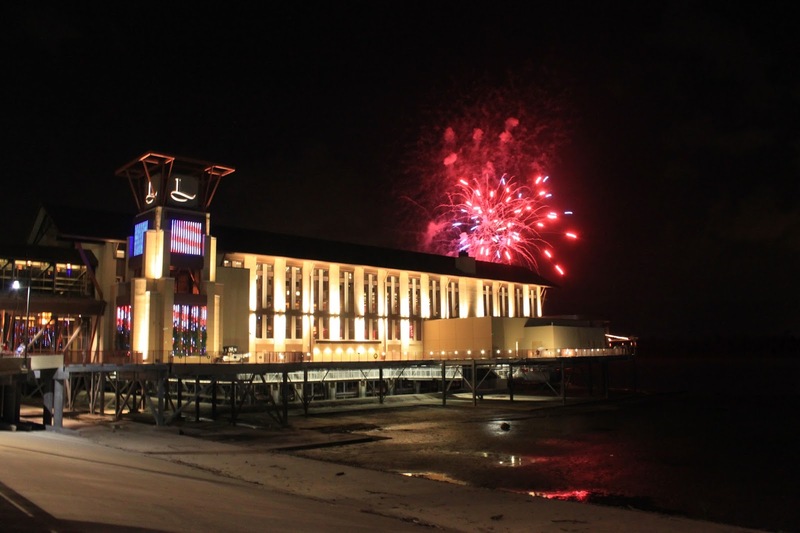 There are plenty of events and venues in Baton Rouge celebrating America&apos;s independence. 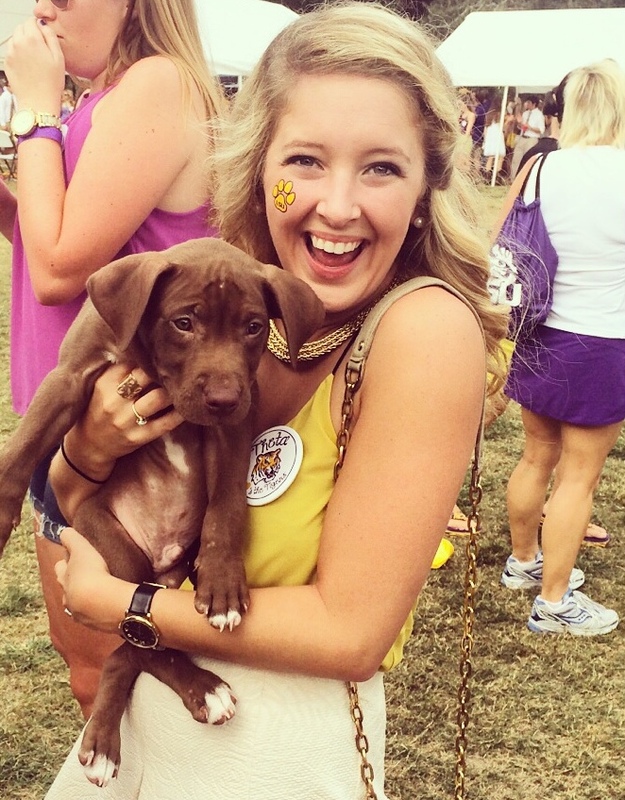 If plans are keeping you in or around Baton Rouge, we hope you will immerse yourself in our rich culture and feast like a local all while enjoying the festivities surrounding this holiday weekend! Fireworks On The Mississippi: Channel 2 presents "Fireworks On The Mississippi." Stop by and enjoy a spectacular fireworks display over the Mississippi River commemorating our nation&apos;s independence. 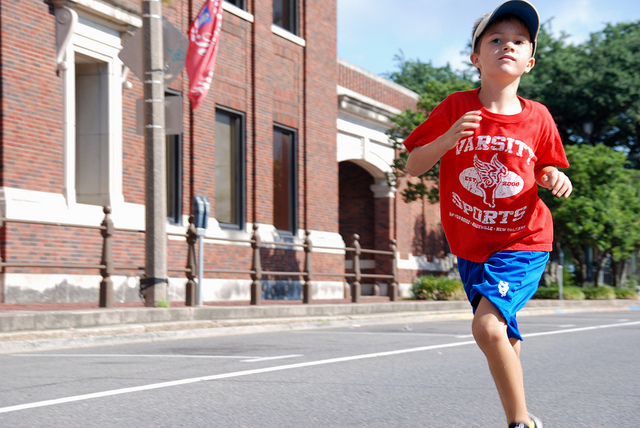 The show begins at 9 p.m.
BASF Freedom Mile: Come run downtown with BASF and the Club South runners during these series of one-mile races, plus a half-mile parent-child run at 8 a.m. You can register for the event here. Photo courtesy of Club South Runners. Independence Day Concert: 11 a.m.-4 p.m. 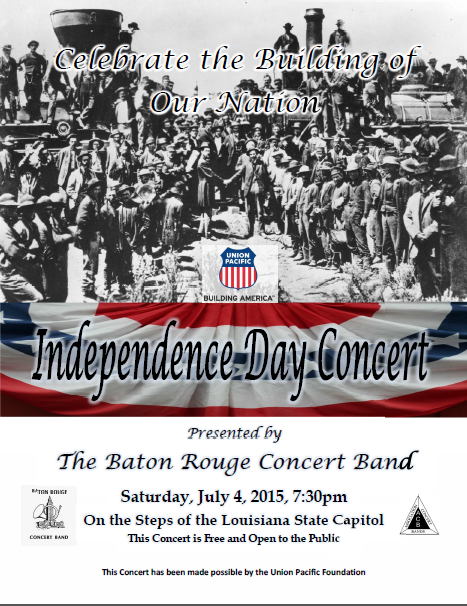 The Baton Rouge Concert Band will play the patriotic hits and classics on the steps of the Louisiana State Capitol at 7:30 p.m. on July 4 for its annual Independence Day Concert. Don&apos;t Miss out on this spectacular live performance! 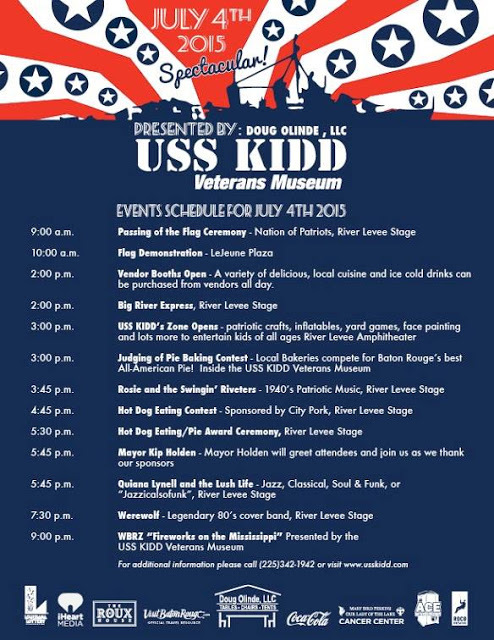 USS KIDD: 4th of July Spectacular, 2 p.m.-10 p.m. What&apos;s better than a free festival and celebrating our country&apos;s independence? Enjoy family friendly fun with inflatables, face painting, patriotic crafts, games and more! Planned activities include appearances from both Mayor Kip Holden and Miss USA Contestants along with a variety of local vendors including City Pork, Chelsea&apos;s Cafe, Jambalaya Shoppe and more to appeal to a variety of taste buds! ROOFTOP POOL, Fireworks Viewing Party, 7 p.m. – 12 a.m. $20 Cover Charge. Enjoy the fireworks show and DJ Triz-A at L’Auberge’s legendary rooftop pool. Must be 21 to attend. Edge, Open to the public all day and night, with live music starting at 10 p.m. No Cover Charge. Must be 21 to attend. 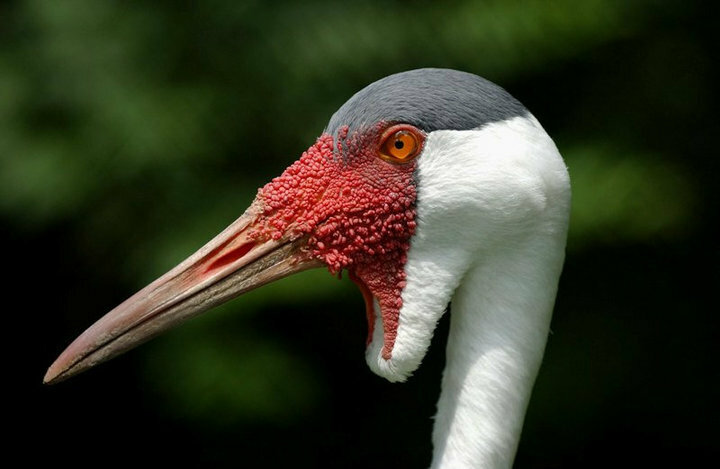 THE LAWN, Fireworks Viewing Party, 7 p.m. - 10 p.m. accompanied by the Food Truck Roundup. Family friendly viewing. Refreshments will be available for purchase. Open to the public. L’AUBERGE PROMENADE, Live music performed by the Organic Radio. 8 p.m. - 12 a.m. Open to the public. 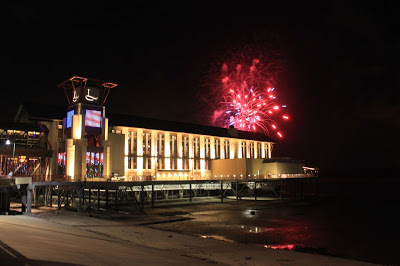 18 STEAK, Dinner and Fireworks Viewing, 5 p.m. – 11 p.m. For reservations, visit mylauberge.com. 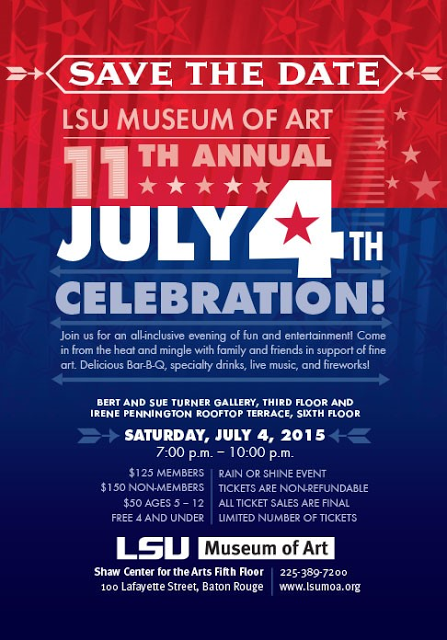 LSU Museum of Art: Red, White & The Blues, July 4th 7 p.m- 10 p.m. Join the LSU Museum of Art and Tsunami on the 6th floor terrace of the Shaw Center for the Arts to enjoy a selection of fine grill, sushi, wine and beer while listening to live music! BREC&apos;s Baton Rouge Zoo: Red, White and Zoo, July 4th, 9:30 a.m. - 5:00 p.m. Visit the Zoo and celebrate with their red, white and blue animal friends. This special day will include amphitheatre programs, games and crafts! 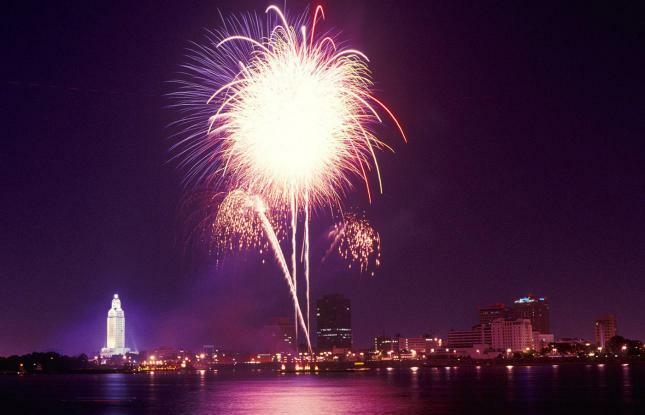 For more information on what&apos;s happening in the Capital City during the July 4th weekend, be sure to visit our website and stayed up-to-date via our Twitter and Facebook pages! Have a safe and happy Fourth, y&apos;all!